Entertainment sites are revisiting 1980s American movies and not liking what they find. Apparently, movies like Revenge of the Nerds and Sixteen Candles are “problematic,” largely because of sexism. I’m still enjoying Killing Eve, but man …. Just midway through the season, we’ve already witnessed an Asian dude having his balls … something … and another dude get castrated by a female assassin. These cringe-inducers are treated as sort of a running gag on the show. I have to wonder who would be laughing if the plot featured female genital mutilation. Just sayin’. 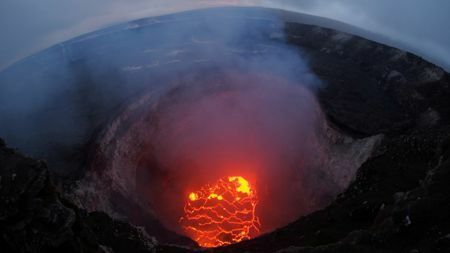 CBS Evening News on Wednesday featured the tongue-twister of the week – “lower lava levels” – courtesy of Carter Evans in Hawaii. Try saying that three times in a row – real fast. Trump fans don’t like it when they are accused of wanting to turn the clock back in America. 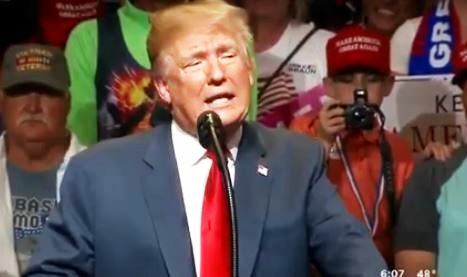 But during Trump’s speech in Indiana, I couldn’t help noticing the kid in the background taking pictures with his camera and flashbulb (above). They still make cameras with flashbulbs? Or maybe that isn’t a flashbulb.